In my post Is it time to go Agile ? I suggested to dispose projects in a bidimensional space, whose coordinates were Innovation and Complexity. This had been done in order to group projects in different classes and to identify for each one the most suitable project management approach. In this post I will expand further the concept of projects grouping but with a totally different goal. The purpose here will be to evaluate reliable indicators to depict the levels of Innovation and Complexity of given portfolios and assess their coherence with the corporate’s profile and business objectives. To do this we will dive a little in vector’s math to find a more appropriate representation of our bidimensional space. As it is known a point in a cartesian plane can be unambiguously identified by mean of its two orthogonal projections on the cartesian axes, as shown in Figure 2. 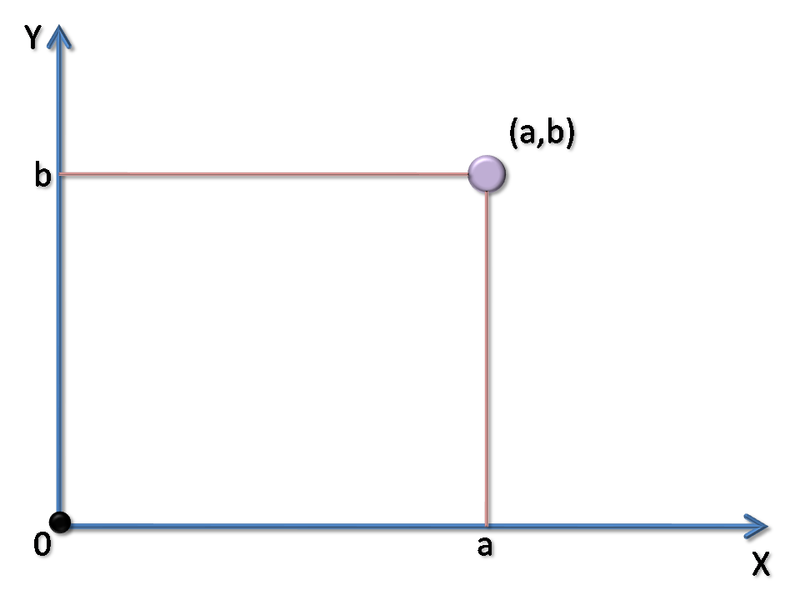 Here the tuple of coordinates (a,b) unambiguously identify the point. This system is called cartesian coordinates system and numeric values are found on the intersections between the cartesian axes and the orthogonal lines traced from the given point. This is not the only possible representation. In Figure 3 is shown the way a point can be unambiguously identified in the same space by mean of a different set of coordinates. This system is called polar coordinates system and a point is identified by its radius, the point’s distance from the cartesian axes intersection and its azimuth, the angle (positive counterclockwise) from the abscissa axis. In Figure 3 are also depicted formulas to switch from a coordinates system to the other. 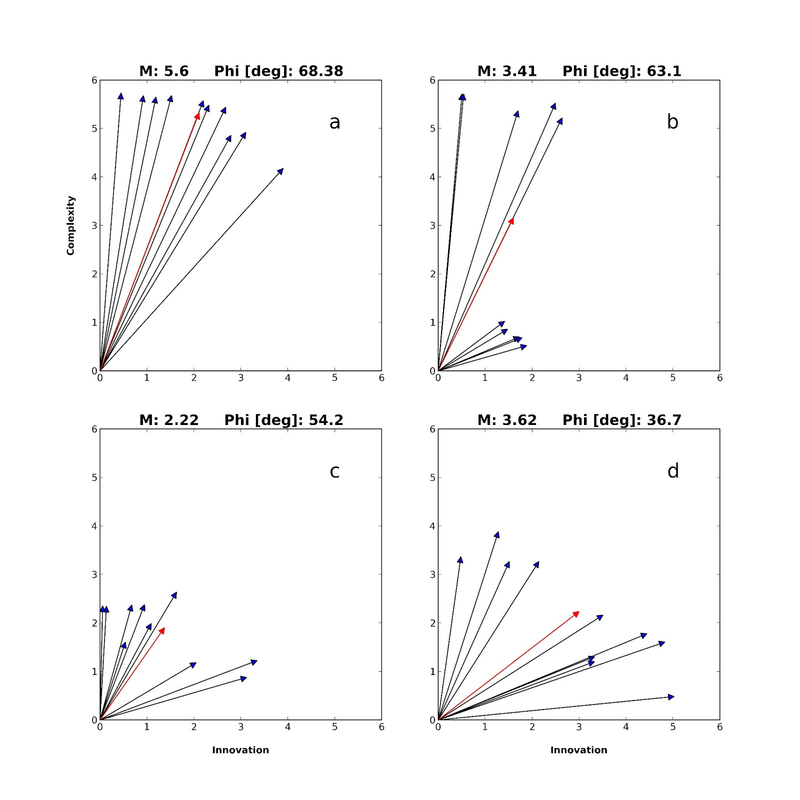 In Figure 4 are shown all possible values for radius and azimuth obtained assigning to Innovation and Complexity values taken from an integer number linear scale ranging from 1 to 6. 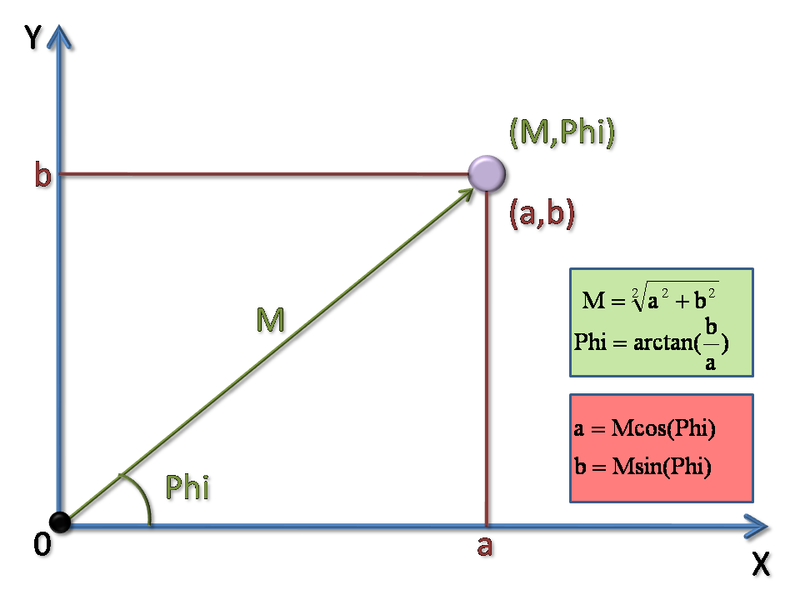 M (radius) is represented in absolute values while Phi (azimuth) in degrees from 0 to 90. An overview on values assignement to projects attributes can be found on my post Risk qualitative analysis. How much complicated ?. Using polar coordinates the project space represented in Figure 1 looks like as shown in Figure 5. Each project is now depicted as a vector and is unambiguously identified by its radius and its azimuth. An alternative representation for projects in a bidimensional space has been introduced, but was it worth it ? 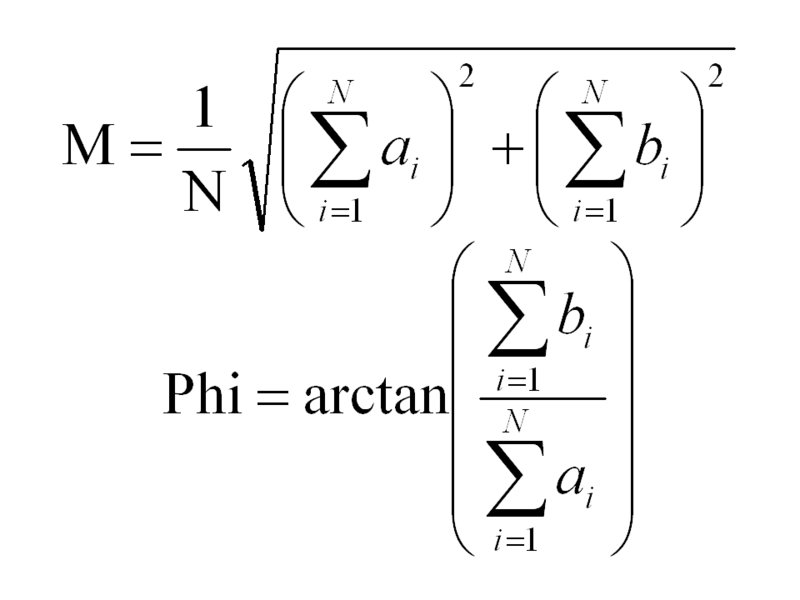 Two numbers we had before (a,b) and two numbers we have now (M, Phi). what is the worth of all this work ? The answer to this question can be found on Figure 6. Observe how the sum operation works on vectors. The sum of N of vectors is still a vector, with abscissa and ordinate equal to the sums of abscissas and ordinates of the N vectors that have been summed together. In this example the red vector is the sum of the blue, yellow and green ones. Consequently the result of this operation depends both on vectors radius and azimuth, as can be observed in Figure 7. Here three vectors with unitary radius are summed together in both the upper and in the lower part of the figure. Vectors in the lower part have a wider range of values for the azimuth coordinate and as a result their summation leads to a vector with a different azimuth and a shorter radius. So we can say that the more two vectors are alike (radius and azimuth) the more the vector resultant from their summation has a greater radius coordinate. As a limit case, if all the 3 vectors in the example were equal in radius and azimuth, the summation result would have been a vector with a radius 3 times the original radius and an azimuth equal to the original one. Following this line of thought we could add up all the project vectors in the bidimensional space and use the resultant vector as a portfolio indicator. Formulas are depicted in Figure 8. The radius value divided by the number of addenda assess how complex is a project in term of Innovation and Complexity, the azimuth how the portfolio is balanced toward the two coordinates. A low azimuth indicates that a Portfolio is balanced toward Innovation, a greater one that a Portfolio is balanced toward Complexity. In Figure 9 some examples can be seen. Here four portfolios are being analyzed using the suggested indicator. 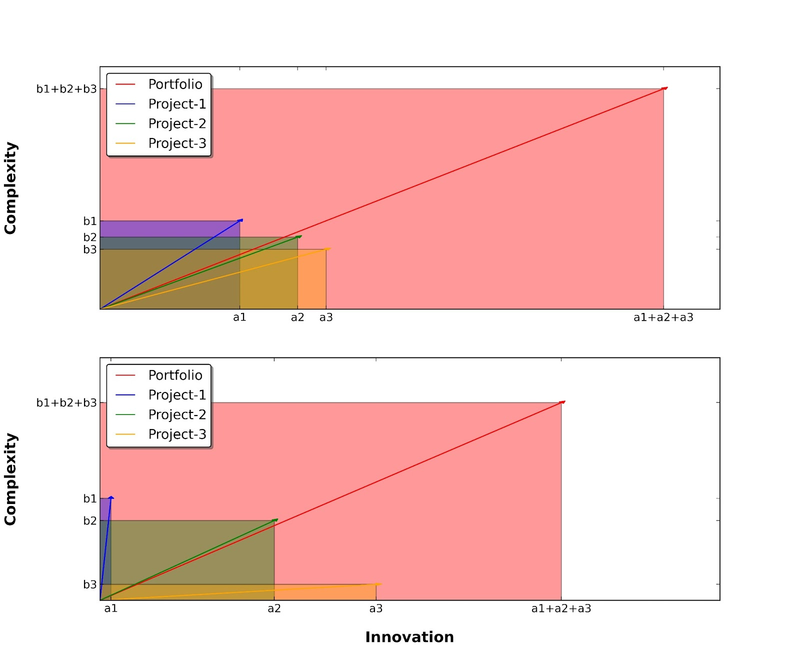 Portfolio in panel a has a lot of projects with an high degree of Complexity and with a medium grade of Innovation. As a result the indicator vector has a great radius and azimuth values, stating its balance toward Complexity. Portfolio in panel b has some project with an high degree of Complexity and with a medium grade of Innovation and some project with a low degree Complexity and low grade Innovation. As a result the indicator vector has a medium values both for radius and azimuth. There is a balance here between 2 different classes of projects. The bunch of projects near to the ascissa axis counterbalance the high Complexity projects, even if it is clear that the portfolio is still polarized toward Complexity. Portfolio in panels c and d are composed by projects with similar degrees of Complexity and Coherence but with very different balances. The indicator vector here reflects well the situation. This approach is expandable toward an higher number of dimensions. In case it would support more complex analysis with more parameters, like the Uncertainty parameter proposed as a third dimension in my post “Is it time to go Agile?”. Property of Euclidean Space in fact holds for every number of dimensions even if, clearly, our graphical representation capability stops to three. The only price to pay is a little more sophisticated math, since in a K-dimensional space we would have K dimensions to sum together for radius evaluation and K-1 azimuth coordinates. Is it time to go Agile? “Is it time to go Agile ?”. 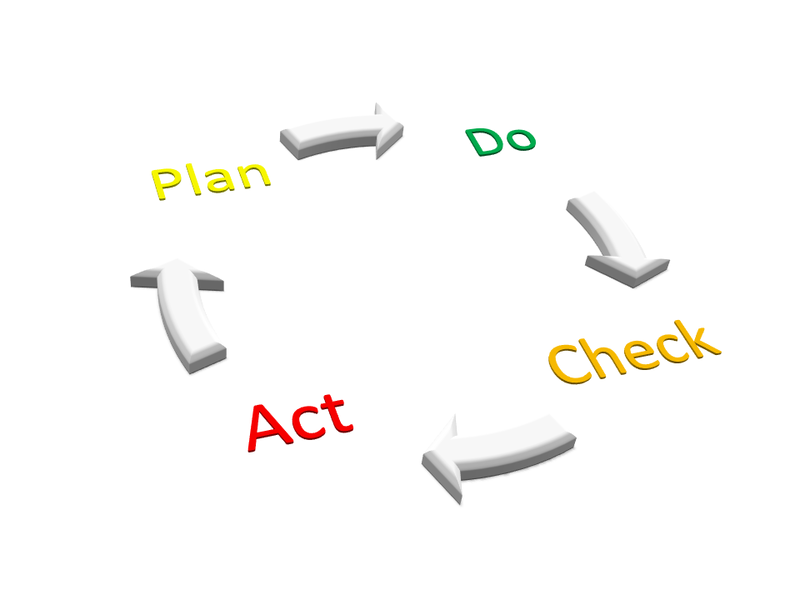 More or less every project management framework/procedure is based on the old plain Plan-Do-Check-Act model. There are planning phases in which decisions on project scope and actions are taken, there are moments in which work is performed and checked against what has been previously established and there are control processes to get the project back on track, whatever “on track” may mean for you. The mode in which these four elements (Plan, Do, Check and Act) are mixed up and sequenced breeds all the differents project management methodologies we know and use in our day to day work. The selection of the most suitable project management methodology for a given project is not an easy task. It requires great expertise and project insight, a deep knowledge of different project management frameworks and the freedom to choose which road to walk down. An opinion that I have and that I would like to share with you and submit to your judgment is that the choice of the project management procedure/framework should not be based on the project deliverables type or specific industry (communications, construction, oil, food, software,...) but on intrinsic project characteristics. Imagine to identify some project indicators and to assess their values for the project you are planning. It would then be possible to place the project in a multidimensional space and select a particular project management approach accordingly. 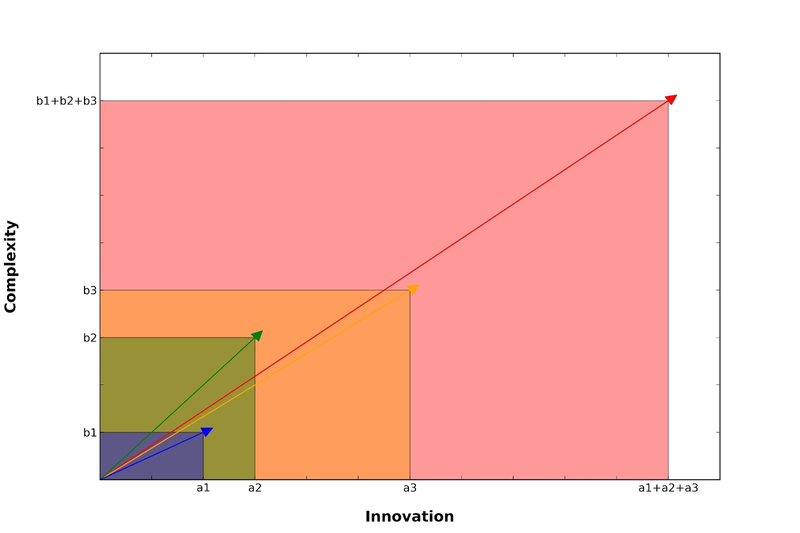 Figure 1 shows a qualitative representation of a bidimensional project space whose cartesian coordinates are Innovation, intended as the degree of innovation apported by the project and Complexity, intended as the difficulty to accomplish the project overall objectives. Projects with a great degree of Complexity and Innovation (as those in the red circle marked B) could greatly benefit of an agile approach. These projects are not uncommon to have unclear scope, undetailed requirements, hidden stakeholders and tough and complex planning phases. 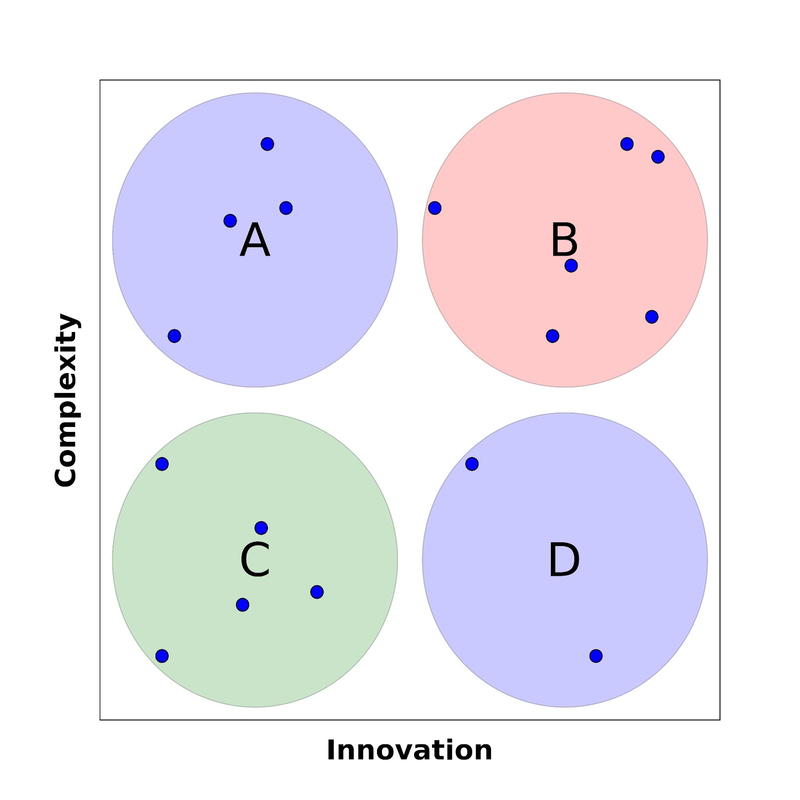 Conversely project with a low degree of Complexity and Innovation (as those in the green circle marked C) could be easily managed with more traditional techniques. Maybe even with a plain old waterfall approach. 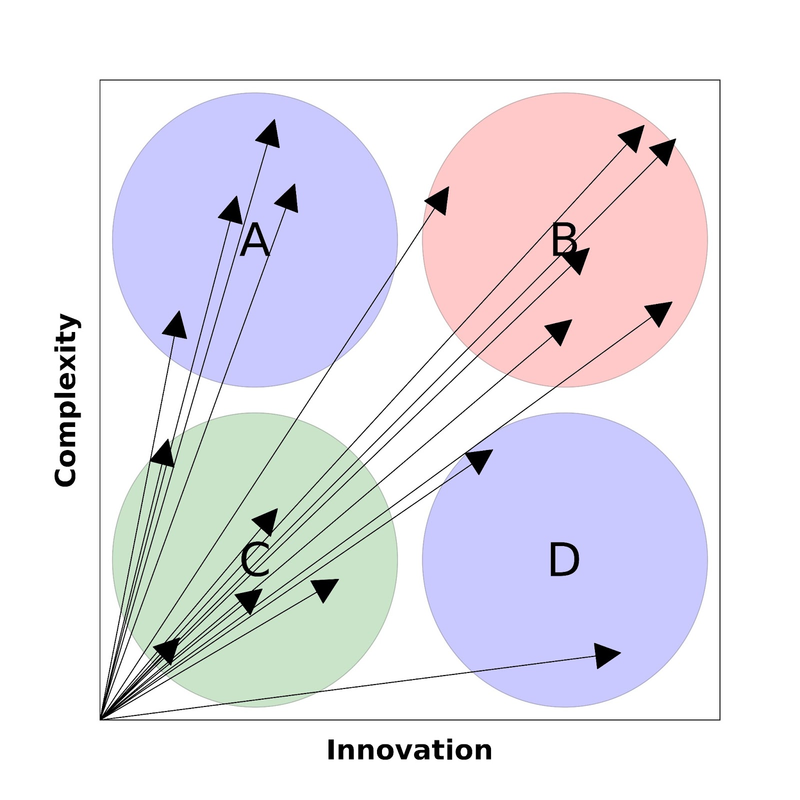 Projects with great Complexity and low Innovation or great Innovation and low Complexity or other intermediate situations would benefit of division in phases (where each phase may become a project in itself and different phases can be managed with different methodologies), iterative planning, rolling-wave planning and other advanced techniques. 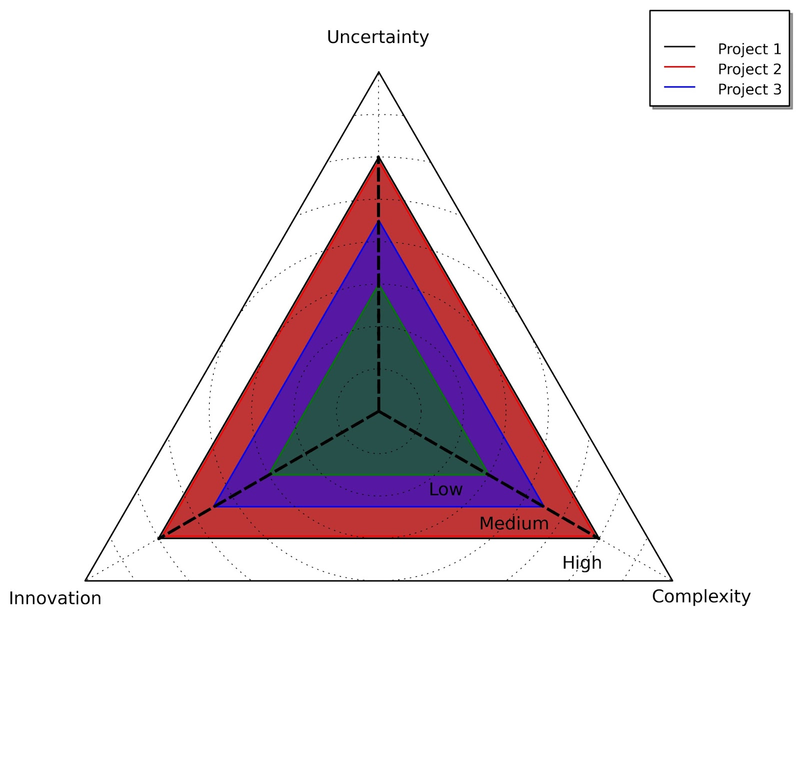 Figure 2 shows a qualitative spider chart of three fictional projects in a tridimensional space that adds Uncertainty as a third cartesian coordinate. Uncertainty is intended as the project overall degree of risk and is reported here to stress its importance to place projects in the proposed space. Uncertainty could be absorbed in Complexity and Innovation and as a matter of fact we can even say that it is a bidimensional function of these 2 variables. 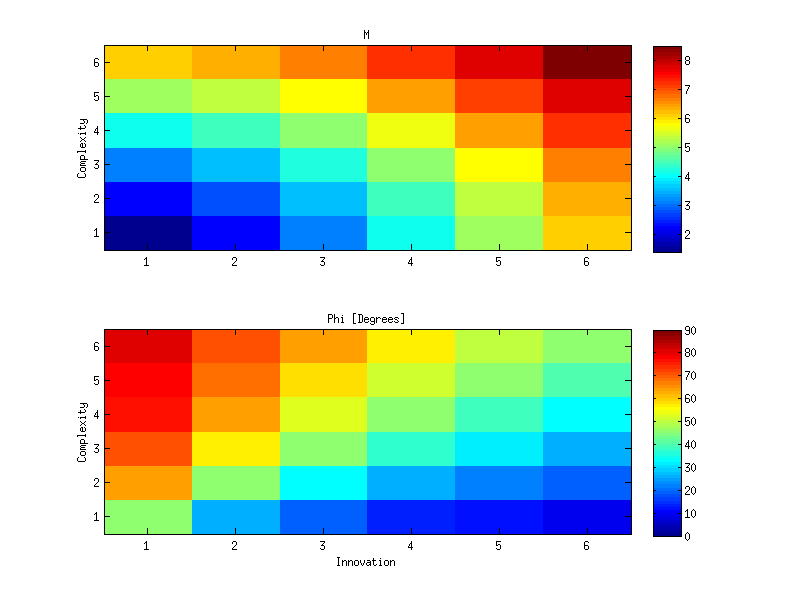 Colors are chosen accordingly to Figure 1. Project 2 should belong to the red circle B, project 1 should belong to Circle C and so on. Spider chart is an effective tool to display data in the form of a bidimensional chart of three or more variables and this make it an exceptional tool to analyze projects in a multidimensional space. So if a project manager got stuck leading a construction industry project with a traditional management approach, maybe are the methodology selection process and the subsequent choice to blame and not the methodology in itself. Maybe the placement of the project in the suggested space would have indicated another methodology as more reliable to achieve the given goals. Conversely I do not find absurd manage a software project with a waterfall approach if the given project has a very low degree of Innovation, Uncertainty and Complexity. Of course there are also other aspects of the issue to be considered. Some management options may not be viable because of project management team poor training in certain areas, executives decisions, stakeholders or sponsor explicit requirements and so on. For example it would be absurd for the project manager to select an Agile approach if nobody in his team has not even heard about it. Sometimes various options may be clearly unsuitable. Sometimes the use of some process or some instrument is imposed. Since the choice could be tricky a project manager should maintain an open minded approach, without preconceptions and prejudices. He must understand the peculiarity of the project, the environment in which it has been conceived and in which it will have to be developed. He must understand his team members capabilities and their degree of engagement in the project. He has to adapt to the environment. So my opinion is that the right question a wise project manager should ask himself is not “Is it time to go Agile ?” but “What time is it ?” or “what my project really needs ?”.